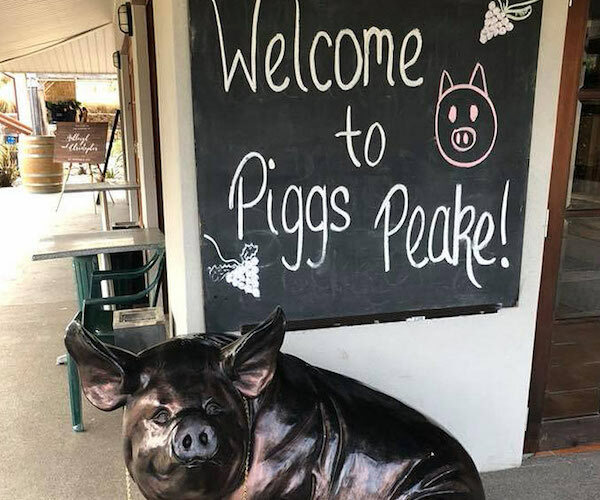 A visit to the Piggs Peake winery is a must when you’re next visiting the Hunter Valley. The awesome staff at the cellar door offer a unique tasting experience, showcasing what can only be described as a huge array of wines. From sparkling wines to ports and luscious dessert wines, there is certainly a wine for every palate. Many of the team hosting your tasting experience are also involved in the winemaking process so not only will your tasting be fun it will certainly be informative. During our visit keeping in mind that Christmas loomed around the next corner, we were on the hunt for some festive wines to add to the Christmas table and Piggs Peake certainly delivered on the brief. Our choices of the day were the Guinea Pig, a light sparkling wine which you could certainly enjoy for a late, post pressie-opening breakfast. Our chosen whites were the 2017 Sowvignon Blanc and Pinot Piggio and the winning reds, the 2017 Pigbrusco (for those who like a sweet red), the 2016 House of Bricks Cabernet and 2017 Big Pig Shiraz, certainly one of those special occasion wines. And to finish… the deliciously sweet Little Pig Verdelho, which will be just perfect with a Christmas trifle, pudding or pavlova. You just can’t go past a visit to this winery, a unique tasting experience, held “out the back” in the winery is sure to be one of your unforgettable Hunter experiences! And, of course if you’re dining next door at Yellow Billy restaurant, it’s the perfect spot to buy your wine to enjoy over a delicious meal.